If you are interested in participating in or learning more about our studies, please email coeliac@wehi.edu.au for further information. Our studies in adults with coeliac disease have provided detailed knowledge of the key peptides in gluten harmful to people with coeliac disease. This knowledge has formed the basis for a novel immune diagnostic blood test that may one day allow coeliac disease to be diagnosed without the need for prolonged gluten consumption. It has also supported the development of a potential treatment for coeliac disease (Nexvax2; currently in clinical trials). This study is expanding on our work in adults to characterise the gluten-specific T cell and antibody immune responses in children with coeliac disease aged 3 to 18 years. The information will be vital for ensuring that new diagnostic tests and treatments can benefit coeliac children. Are oats toxic in coeliac disease? The safety of oats for people with coeliac disease is controversial. Australia and New Zealand exclude oats from the gluten free diet due to safety concerns, but many other countries do not. Oat is a nutritious grain that is high in fibre and may have a range of health benefits, but it is important to determine if they can be safely consumed by people with coeliac disease. We have shown that almost 10 per cent of people with coeliac disease have T cells that target peptides within oats, potentially putting them at risk of adverse effects. 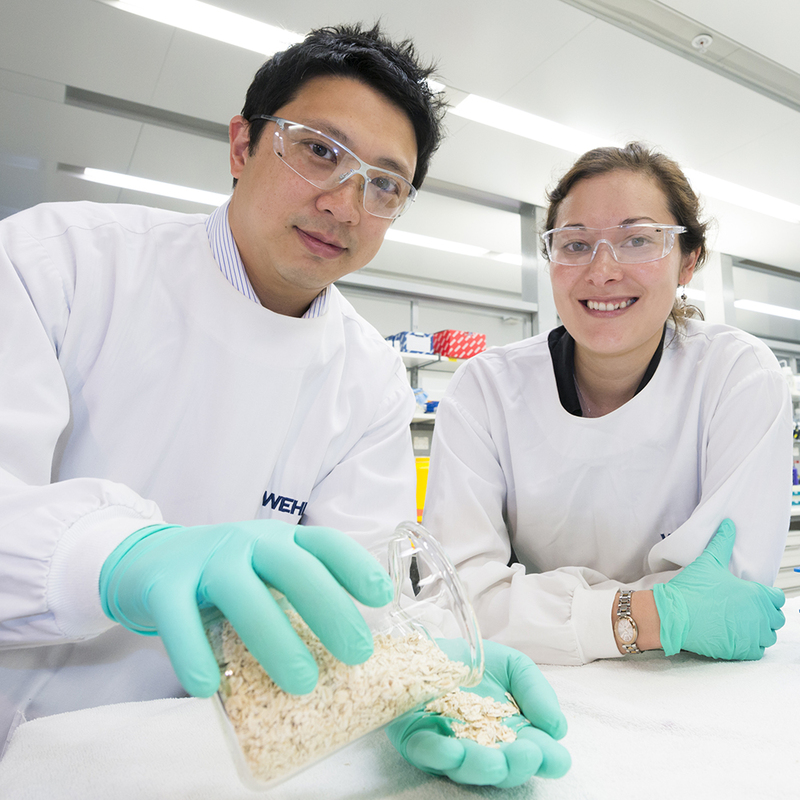 This study aims to definitively determine if people with coeliac disease are at risk of oats toxicity, whether this can be predicted by an immune blood test or food test, and whether a specific type or dose of oats can be consumed safely. This study will involve the consumption of contamination-free oats, immune blood tests and for some, gastroscopy and biopsy of the small bowel. The information in a person’s whole genetic code (genome) has enormous potential for being used to improve that individual’s medical care and treatment. A genomic test for people with coeliac disease is particularly appealing as this illness has a strong genetic component. In collaboration with Associate Professor Mike Inouye and his team (Centre for Systems Genomics, University of Melbourne) we are developing a genomic risk tool that can help identify people at high-risk of developing coeliac disease. We have shown this test performs better than the widely employed HLA-DQ2/8 gene test. This study aims to validate the clinical usefulness of this tool in a large number of participants who have coeliac disease, are related to someone with coeliac disease or are non-coeliac controls. A genomic tool may help identify which person, for example a relative, is at high-risk for coeliac disease development and needs closer monitoring. Genomic information may also provide insights into how coeliac disease may behave over time, such as those at higher risk of developing certain manifestations or complications. We aim to use this information to guide and improve medical care. Why does the gluten free diet fail? The gluten-free diet is the main treatment for coeliac disease, yet many patients continue to have intestinal damage or experience symptoms despite many years on the diet. Ongoing intestinal damage is concerning as it is associated with a higher rate of complications such as osteoporosis, infections, refractory coeliac disease and cancers such as lymphoma. This project is investigating the reasons why the gluten-free diet fails in some patients despite their best attempts to exclude gluten. While it is assumed that low amounts of inadvertent gluten exposure is responsible for dietary failure, the actual causes for this have not been systematically addressed. This study is exploring the role of gluten contamination in commercial gluten-free foods and gluten-free products sold in food outlets, examining food handling, labelling and testing practices in industry, and looking at patient factors that contribute to knowledge and compliance to the diet. The findings will inform targeted strategies to improve gluten-free diet outcomes for people with coeliac disease. What is the role of the microbiome in coeliac disease? While specific genes, such as HLA-DQ2 and/or HLA-DQ8, are critical for the development of coeliac disease, environmental factors are also considered important, possibly as ‘triggers’ of disease. How they might do this is a very important question. Emerging evidence suggests an important role for the eco-system of microbial organisms in the gastrointestinal tract, termed the ‘microbiome’. Professor Elena Verdu and her team (McMaster University, Canada) have identified specific bacterial populations more common in people with coeliac disease than those without, and that these bacteria digest gluten differently compared to commensal organisms in healthy people. The gluten peptides resulting from the action of these specific bacteria strongly stimulate disease-relevant T cells from patients with coeliac disease. This research raises the possibility that specific bacterial alterations in the microbiome may have an important effect on gluten metabolism and could affect the risk for coeliac disease development in genetically susceptible people.